Summer weekends were for day trips when I was growing up. Mom and dad would pack us all into the station wagon and off we’d go to New River Beach or Deer Island, Campobello and Eastport, sometimes to St. Andrews or St. Martins and occasionally King’s Landing and Mactaquac. These were dad’s “tours to nowhere” as we called them, fun car trips that didn’t always take us where we originally planned. We sang, a lot, and I suspect I had the whole Camp Glenburn repertoire memorized by age four. There’s a lot to be said about getting away as a family on weekends, even if it’s just for a day. These little trips were about making memories and mom and dad knew that. We did lots of beach exploring, took many ferryboat rides and had fantastic picnics. That’s what mom did for these getaways. 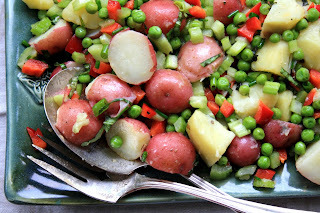 An easy picnic addition was this potato salad from an early 1970’s Red Book magazine. The dressing isn’t mayonnaise-based so you don’t have the same hot weather storage worries. The salad is also loaded with vegetables, so there is more flavour and textures than your regular potato salad. In the meantime, in a large bowl toss the celery, peppers, scallions and herbs with half of the dressing. I hope you enjoy it...Summer is definitely potato salad season.